Wonersh village lies in a valley bounded by Chinthurst Hill to the west and Barnett Hill to the east. It is four miles from Guildford and lies on the B2128 road from Guildford and Shalford to Cranleigh. The village lies in the Green Belt and is designated an Area of Great Landscape Value. Wonersh village is a close knit community, lying in a valley, surrounded by and interspersed with commonland. 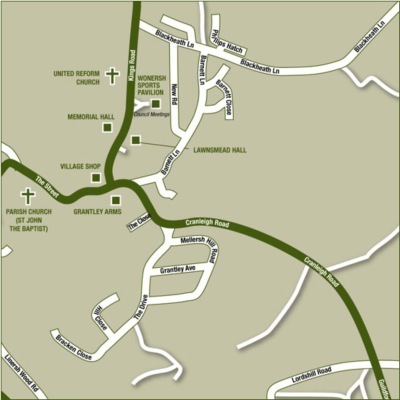 The village has a network of footpaths and bridleways leading to the surrounding area including the Downs Link bridleway. There are also paths from the B2128 to the tops of both Chinthurst Hill and Barnett Hill which afford outstanding views of the village and its environs. At the top of Chinthurst Hill is a tower folly built in the 1930’s, set in a wooded area managed by Surrey Wildlife Trust. There are two main areas of common land in the village, the Common and the Platt. The Common, on which cricket, football and stoolball are played provides a large open space in the centre of the village. There is a modern sports pavilion providing facilities for the sports clubs and social members and a Parish Council office. On the other side of the Common is a well equipped playground, funded by local residents and maintained by the Parish Council. The Platt is a rare example of an ancient meadow that has never been ploughed. It is a thriving habitat for local flora and fauna and the grass is allowed to seed before it is cut for hay each year. As a greatly valued local amenity the Parish Council has adopted a Wonersh Common Enhancement and Management Plan to guide its stewardship of the common land in Wonersh. Protecting our rural heritage is a majoer commitment of the Parish Council and Waverley Borough Council. We hope you willl find the attached guidance about access tracks across the common land helpful. In addition to the common land is Wonersh Church Green, a quiet area of grass and trees, surrounded by old walls and a distinctive, arched gatehouse. It is the site of the original Wonersh House. The land was acquired for the village by Mrs Cook and is managed and maintained by a charitable trust administered by trustees with close associations with the village. The gatehouse is home to a colony of protected bats. Wonersh has two churches, two halls, a village shop and post office, a pub and two nursery schools, all of which help contribute to the active life of the village. There are also a number of clubs and societies which run in the village.